Here are a few things of which lately, I just can’t get enough. My cousin gifted me with this lovely spike bracelet and another chain link J.Crew replica. 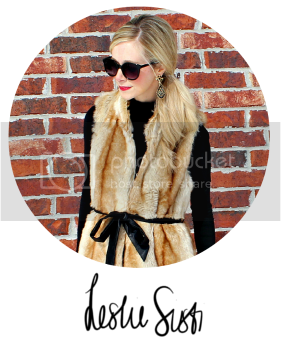 Groopdealz has really great items all the time, especially for accessory-loving ladies. Be sure to check them out often! I die for an easygoing wave or curl, but right now I’m totally on board for pin straight hair. I love this refreshing change, which seems to be my jam lately. Not that I’ll retire the curling iron any time soon, but this just seems a bit fresher for the cooler winter months. 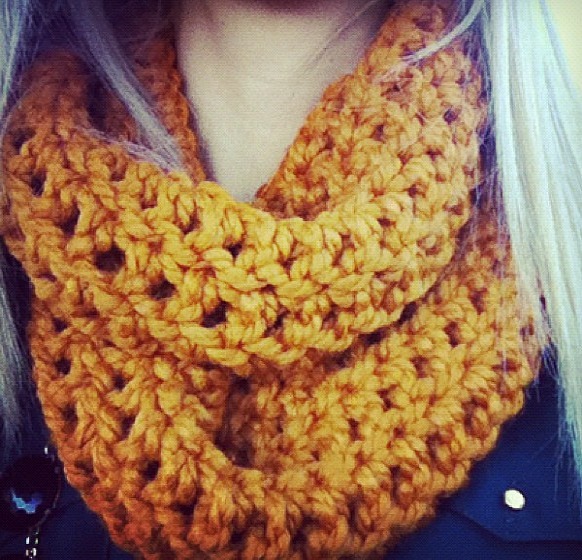 Y’all may have seen mine on Instagram or Twitter, but I’ve been living in my goldenrod Lovesmith scarf lately. It’s cozy and this bold hue surprisingly goes with just about everything. Pinky swear. 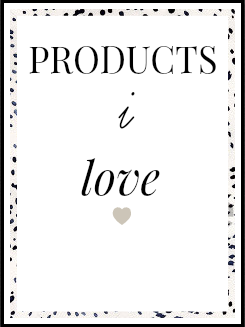 What can't you get enough of lately? 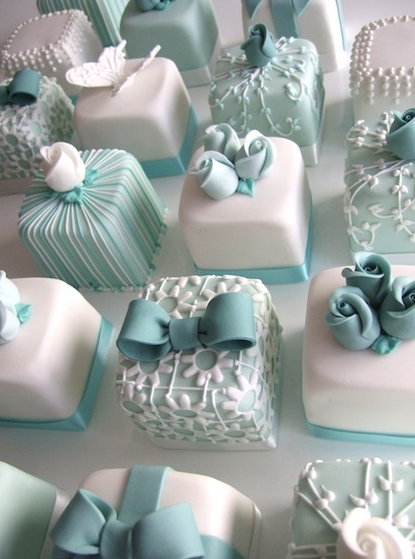 Those dainty cakes are adorable -- I'm such a sucker for cute stuff! I can't get enough of Lindt dark chocolate and Sbux Christmas Blend. Tis the season! Straight hair is just so easy. I've been wearing mine straight more often, and I LOVE that scarf!! if you like the Green Mountain brand, try the Wild Mountain Blueberry !! I know it sounds awful, but it is wonderful. Your hair looks great pin straight! Try Chocolate Covered Donut, or there is Raspberry Truffle K-cup that I adore, especially mixed half and half with mocha. Delicious. Always my Sunday morning treat. 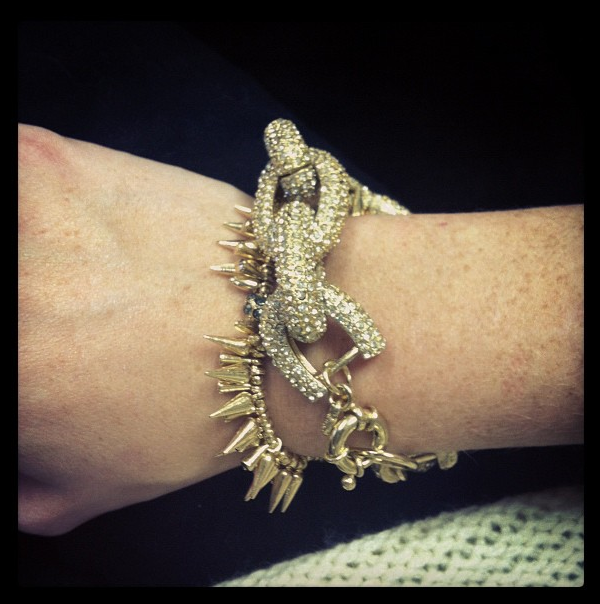 Love, love, love the spike bracelet! Love those bracelets! You should try the Butter Toffee K-Cups for the Keurig. I think.... Mrs. Jeans (??) makes them. SO freaking delicious! i went to savoir-faire in fay a couple of weeks ago and i swear IT is my new jam. i saw those scarves on their instagram but they aren't selling them online. boo! is it bad i wanna make another trip to fay just to shop at SF..? hey three hours ain't that bad riiight?? I love your hair any way you do it, girl! I go through phases like that.. curly.. straight.. etc. right now, I'm just doing my darndest to grow it out before the wedding next year, so I'm TRYING to avoid heat styling other than blow drying and round brushing. :) And I liked the pic on instagram, but I LOVE those bracelets! Adorable together! Apple cider for the Keurig is fantastic!!! But avoid the hot chocolate. We basically only use the Green Mountain Nantucket Blend and Breakfast Blend KCups in our house. I like Wolfgang Puck too. I die for petit fours. There's a bakery here that makes THE BEST, ever. I have been loving the breakfast blend k-cups too! I have been a sucker for scarves every day with my outfit and fun holiday nail polish. Essie has some great shades right now! Love the scarf, and Groopdealz is my newest obsession...even just for window shopping. Mmm petit Fours, way to make a dieting girl drool! :-) Love the scarF! Your hair looks good both ways! I'm on the groop dealz mailing list also. They have some really unique things with great prices. Petit Fours...looks delish. 'tis the season!! Green Mountain Caramel Vanilla Cream (Amazon 24-count for $15.99), or order straight from green Mtn. 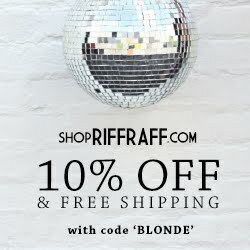 They have good deals for recurring orders (free shipping & $2 off per box). Yummy!